Four-time AMA World Supercross champion, Ryan Villopoto, will make his global return to supercross racing in November, as he’s confirmed to race both nights of breathtaking supercross action at the 2016 AUS-X Open. The announcement that Villopoto will race comes on the day that tickets go ON-SALE to the public, and with Saturday’s event in 2015 selling out within a matter of days, fans are urged to reserve their seats early to ensure they don’t miss out. 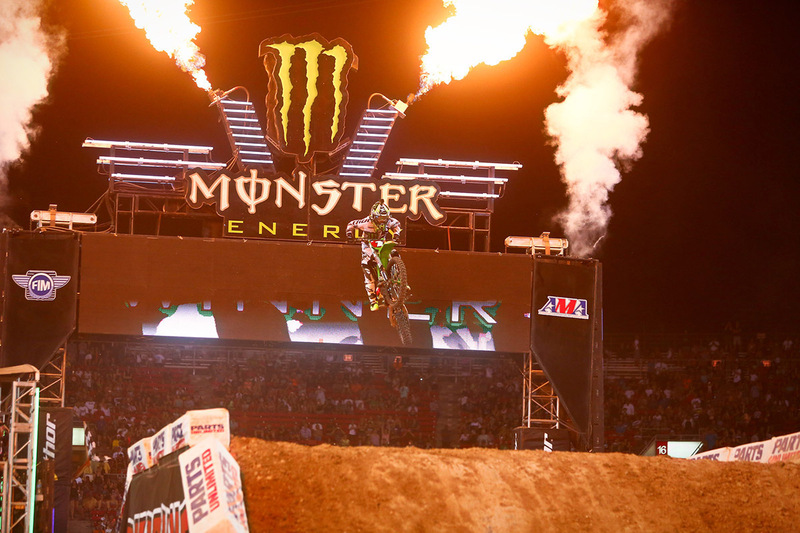 The 2016 AUS-X Open will mark the very first time around the globe that spectators will witness Villopoto in action, as he competes over two nights of incredible supercross competition inside Sydney’s Qudos Bank Arena (formerly AllPhones) on the 12th and 13th of November. Villopoto stunned the entire motor racing community in early 2015, announcing his shock retirement from the sport after absolutely dominating the 2014 AMA World Supercross championship. Following his retirement, the 27-year-old from Poulsbo, Washington, has not competed in a single supercross race since. Villopoto will face off against two-time World Champion, Chad Reed, during both nights of competition, along with a whole host of fast Australian supercross racers and more. “I’m really excited to announce that I’ll be lining up behind a supercross gate again in Sydney, Australia, this November for the second AUS-X Open event!” said Villopoto. “Racing (against) Chad will be awesome. I think that not only will Australian fans be tuning in, but the world also. “It’s a unique opportunity for supercross fans – it’ll be a thing like, ‘cool, Chad’s there and so is Ryan – lets see how this pans out’ – which will be exciting. “I’ve chosen the AUS-X Open event (to race at) because of the vibe. Obviously there are other races that are similar, however I generally looked at those as ‘headache’ events. “The AUS-X Open seems a bit different; a lot more laid back and just a hell of a time”, finished Villopoto. Villopoto holds a joint record with The King of Supercross, Jeremy McGrath, as the only two riders in history to win four consecutive AMA World Supercross Championships, with Villopoto’s reign lasting from 2011-2014. Along with his championships, Villopoto cemented his legendary status by catapulting his way to fifth place on the all-time supercross wins list, with a total of 41 wins. Minister for Trade, Tourism and Major Events and Minister for Sport, Stuart Ayres, states having Villopoto competing in Australia is a fantastic opportunity for fans.